GO Weasleys GO!!!!!!!!!! !Show them you don't mess with HP!!!!! What are you gonna do? Turn me into a toad? HAHA. ^What? No one even said anything to you! AND WE WILL AVADA KADVRA YOU! Avada kedavra and all the twilighters die GO Weasleys GO!!!!!!!!!!! 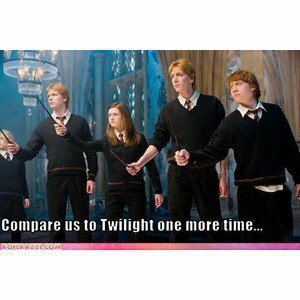 Someone post this on Harry P vs Twilight club, love it! iF ALL TWILIGHTERS DIE, HOW come I'm here? besides, Twilight vamps can easily outrun, outsmart, and - oh whatever, but seriuosly, what can i few sticks do to vampires? sticks with phoenix featers, dragon insides and veela or unicorn hair that happen to be capable to kill many people in HP!!! !